The Daily Scam | Free Airline Tickets! You are here: Home » Free Airline Tickets! Many of us are old enough to remember the expression “if it seems too good to be true, it is.” That expression feels so self-evident! So why do people fall for the most ridiculous flim-flam tricks over and over? Is it because the delivery methods of these age-old scams have changed, leaving some of us to think that, perhaps, this time its different? What are the red flags that suggest this is a scam? Alitalia’s website is Alitalia.com and Alitalia.it, not alitalia.com-free.xyz. In fact, “dot-xyz” domains are often used by criminals for malicious purposes. 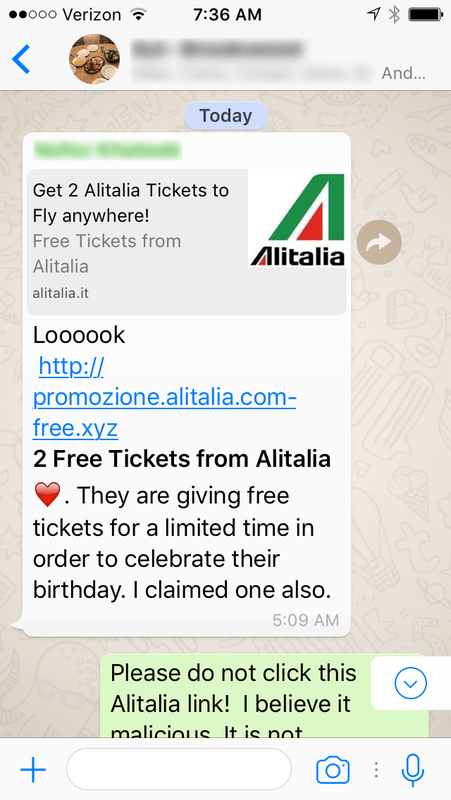 Also, both “promozione” (promotion) and “alitalia” are both sub-domains in this address. Anyone can create a sub-domain that says anything at all. The actual domain name that had to be registered with a service is com-free.xyz. The domain com-free.xyz was registered on March 14, a few weeks before we found this scam. It was registered through a privacy service, masking the real owner’s personal information. Most importantly, checking the link with VirusTotal.com on April 17 shows 8 different antivirus/antimalware services that have identified this domain as a phishing domain or simply malicious. 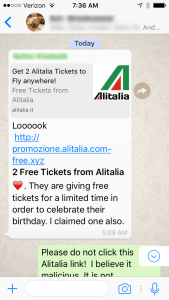 WhatsApp news: Users warned of airline SCAM promising free Emirates flights A NEW scam offers WhatsApp users free Emirates flights if they fill out a “fast” survey. WhatsApp users are being warned of a viral scam that is currently going around. The scam offers users two free Emirates flight tickets if that fill out a “fast survey”. The link in the WhatsApp message appears to direct people to the Emirates website. Once completed users are then notified that they have “won” two free tickets. But to obtain the tickets, they have to share the survey with ten other WhatsApp users. Once completed, the user is redirected to another webpage, which asks for them to confirm their details. In fact it asks the users to subscribe using their phone number to a premium message number and the cost of this will appear on the person’s telephone bill at the end of the month. If the person goes on to complete all the steps, they are then redirected to a page which reads: “Thank you for attending the survey. If you don’t know the sender or can’t verify the source separately, delete.